Coming up we'll hear an encore performance of one of the most explosive interviews we did this past year. Stay tuned for my conversation this past July with GATA's Chris Powell. Chris pulled no punches on the important topic of government manipulation in the metals markets, and he has a dire warning for executives of mining companies if they continue to sit back and ignore the problem. You simply won't want to miss this replay of our interview with Chris Powell coming up a little bit later in the podcast. Also in this special Christmas Eve edition of the program, we'll take a look at a new development in one of the most extraordinary inflationary episodes of modern times. But first, let's get to this week's market action. Investors are enjoying a Santa Claus rally, with stocks up, crude oil up, and precious metals mostly up as well. Gold prices currently come in at $1,075 an ounce, showing a modest weekly gain of 0.8%. Meanwhile, silver looks higher this week by 1.5% to trade at $14.38. The precious metals appear well-positioned for a more significant rally after getting extremely oversold heading into the Fed's rate hike decision. Both gold and silver have since advanced, but the bulls still have more work to do to get prices to break out above their months-long trading ranges. Tis the season for giving. But when Congress gets into the giving spirit, it sticks you, the taxpayer, with the bill. Last week, Republican leaders gave President Obama the gift of a $1.1 trillion spending bill that funded every plank of his agenda with no strings attached. Democrats couldn't contain their glee of the victories they achieved with the Republicans supposedly in charge of both chambers. The only concession Republicans got from Democrats was a lifting of the ban on U.S. crude oil exports. In exchange for that, Democrats got everything they wanted and more. President Obama called the spending bill “a good win” for his party. By contrast, it hasn't been a good week for Republican Speaker Paul Ryan, who is getting an earful from his constituents, from conservative commentators, and from conservatives in Congress who feel betrayed. The Ryan leadership machine completely shut out fiscal reformers to make sure they couldn't add any riders that would deprive Democrats of anything they wanted. The bill proceeded through secret, backroom negotiations. And Republicans got out-negotiated, big time. Establishment Republicans didn't want to be accused of being grinches for insisting on spending restraint. So Paul Ryan and Senate Majority Leader Mitch McConnell rounded up enough Republicans to vote for what was essentially a Democrat bill. In any event, the expressway to more debt and eventual fiscal ruin seems to have no exits. The official national debt of $19 trillion is just the tip of the iceberg. The government faces more than $200 trillion in unfunded liabilities. That's a lot of dollars that will have to be created that don't currently exist. And that's why despite the recent wave of falling commodity prices, a massive inflation could loom in the years ahead. In a worst-case scenario, we could see hyperinflation. One of the most recent examples of hyperinflation was the case of Zimbabwe. It got so bad a few years ago that the government started printing currency notes in denominations of $1 trillion, $10 trillion, and $100 trillion! That's what can happen when a nation attempts to print its way out of a financial hole. By 2009, the Zimbabwe government basically admitted that the Zimbabwe dollar was worthless and began allowing South African rand and U.S. dollars to circulate. Now the troubled country is also welcoming the Chinese yuan. On Wednesday, the government of Zimbabwe announced that it would accept the yuan as an official currency. The Chinese yuan was recently added to the Special Drawing Rights currency basket by the International Monetary Fund. Its inclusion in Zimbabwean commerce is meant to attract Chinese tourists and investors. It will also allow Zimbabwe to pay back loans to China in yuan. Another motivation is geo-strategic. The Zimbabwe regime headed by Marxist Robert Mugabe can use the yuan to get around U.S. and international sanctions. The Mugabe model of ratcheting-up socialism, rapacious land grabs, and runaway money printing serves as a warning to all countries that go down that road. The U.S. may never get to the point of hyperinflation. But even just a rise in inflation back to 1970s levels could bring about calamities in financial markets and severe financial pain to people who are unprepared. If Zimbabwe serves as a warning, then our Silver versus Zimbabwe Dollar Display serves as a powerful illustration of the fundamental difference between reckless fiat money and honest hard money. The Silver versus Zimbabwe Dollar Display features an actual 10 trillion dollar face value Zimbabwe note along with a genuine silver American Eagle containing 1 troy ounce of .999 fine silver. It is available for just $79.95 from Money Metals Exchange and perfectly depicts the point of what can happen when a government loses control of its paper currency. Well now, for more on one of the biggest stories among the precious metals community in 2015, the manipulation that's taking place in the gold and silver markets, let's get right to this encore performance from July. Mike Gleason: It is my privilege now to welcome in Chris Powell, Secretary Treasurer at the Gold Anti-Trust Action Committee, also known as GATA. 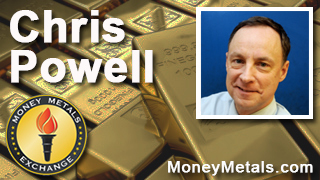 Chris is a long-time journalist and a hard-money advocate, and through his tireless efforts at GATA he is working to expose the manipulation of the gold and silver markets. Through GATA's works over the years, some important revelations have come to light, which should concern everyone. It's good to have you back with us Chris thanks for taking the time to talk with us today. Chris Powell: Oh, delighted to be here Mike. Mike Gleason: Well I know you've only got a little bit of time here so I'll keep it short and I'll jump right into it: Several days ago, we had another attack on the gold market – right as it was holding above a critical price support zone. Someone sold several billions of dollars in gold futures contracts during the wee hours of the night immediately before the Chinese trading day began. It happened during a time of low liquidity like it normally does, and it took the price down over $40 in the matter of a few seconds, halting trading twice for a brief period. What are we to make of all this Chris? GATA brought a lawsuit in U.S. district court in Boston back in 2001. I attended the only hearing on this lawsuit, and an assistant U.S. attorney representing the Fed and the Treasury Department told the court in support of a motion for summary judgement dismissal that the lawsuit had to be dismissed because the complaint of market rigging had no remedy at law. Because the assistant U.S. attorney said the United States government claimed the power to do all the market rigging that our lawsuit accused it of doing! I think it exists mainly to make sure that there is no worldwide voice for gold investors and gold mining companies, because it's absolutely useless in the context of the attack on the industry. It will have to answer for itself if anybody wants to try to get answers out of them. I wish the financial press would call up the World Gold Council today and ask it, "Hey what do you think about what happened Sunday night and Monday morning? Are you in the least suspicious about it?" I think they'll just get stony silence out of them and I think they’re really the worst of the industry. Mike Gleason: Will definitely be interesting to see how much longer people are going to put up with it. I definitely sympathize with everything you're saying, it is quite frustrating. Well, excellent stuff Chris even though it can be a little bit of a bleak picture here, thanks for being so willing to speak the truth about what's going on. I know it must be a frustrating venture at times but there's a lot of people out there in the precious metals community, ourselves included, who do appreciate the work that you're doing at GATA there. Now before we let you go, can you give our listeners more info on how they can learn more about this and then follow GATA's work? Chris Powell: Oh sure Mike, again thanks for letting me harangue you about this. GATA is the Goal Anti-Trust Action Committee, our internet site is gata.org. We're a non-profit educational and civil rights organization. We've got tax exempt status from the U.S. Internal Revenue Service. We are very grateful for any donations that can be made to us, you can donate by credit card over our internet site or get our address off the internet site and send us an ordinary check, although I'm very reluctant to touch for donations these days now that our industry has been just so devastated. I'm not sure that anybody's got any money to give us anymore but we will try to keep flying the flag and pleading the case for free and transparent markets and limited and accountable government, particularly for free trading gold and silver. As defenders of economic liberty through the world, we do put out some dispatches to our email list every day and if people would like to get on our list they can just go to gata.org and sign up for our dispatches in the right hand column of our internet site. Mike Gleason: Well it's definitely a noble endeavor Chris and we appreciate it very much. Thanks again to Chris Powell of the Gold Anti-Trust Action Committee, again the website is gata.org. We urge everyone to check out the great content available there that Chris and the guys put out on a regular basis. And before we close, we should reiterate and note that despite what seems like an awfully bleak picture for precious metals investors recently, eventually, market forces will win out. If low prices continue to devastate the mining industry, production will fall and shortages will crop up. This forces prices to rise. So if you believe gold and silver have a bright future in the long-term, today’s suppressed prices are really a gift. It gives you more time to accumulate more ounces at what appear to be bargain prices. Well I hope you enjoyed a replay of that interview, one we felt was important enough to share with our loyal audience a second time. Be sure to check back next week for our final weekly Market Wrap Podcast of 2015. Until then this has been Mike Gleason, thanks for listening. And from all of us here at Money Metals Exchange, we hope you and your family have a very Merry Christmas, and I'll talk to you next week on our special New Year's Eve podcast.